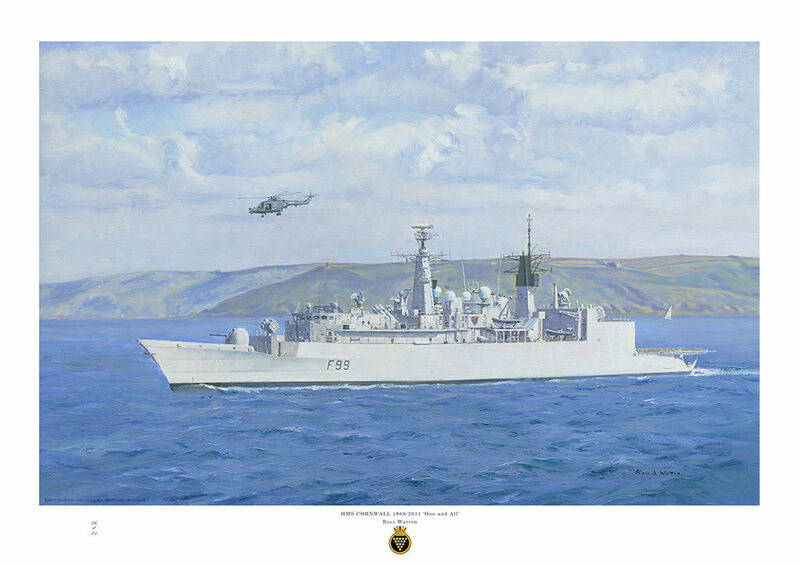 HMS Cornwall (F99) a Batch 3 Type 22 frigate built by Yarrow Shipbuilders, launched on 14 October 1985 by Princess Diana and commissioned 23 April 1988. She is the sixth ship to bear the name in the Royal Navy. Cornwall has carried out many important duties, particularly in the Persian Gulf. In 2007 fifteen of her crew were seized and held for 13 days by Iranian military personnel. During February 2011 in the Gulf of Aden, she rescued five Yemeni fishermen and captured 17 Somali pirates. Her length is 486 ft 9in, with a standard displacement of 5.300 tons and top speed of 30 knots. After 22 years service she decommissioned 30 June 2011. Original painting sold to a collector in Belgium.